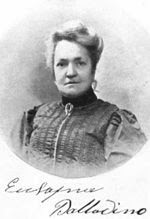 On this day in the year 1918, famous Italian spiritualist-medium Eusapia Palladino passed away. She was best remembered for her ability to enter a state of trance and levitate during seances. Her Warsaw séances at the turn of 1893–94 inspired several colorful scenes in the historical novel Pharaoh, which Bolesław Prus began writing in 1894. Palladino was born into a peasant family in Minervino Murge, Bari Province, Italy. She received little, if any, formal education. Orphaned as a child, she was taken in as a nursemaid by a family in Naples. In her early life, she was married to a travelling conjuror and theatrical artist Raphael Delgaiz whose store she helped to manage. Palladino later married a wine merchant, Francesco Niola. Read More.